Today I found out Mark Hamill currently holds the record for playing the Batman character of “Joker” longer than any other actor and in more spinoffs. “I’ve never seen him play the Joker”, you say? 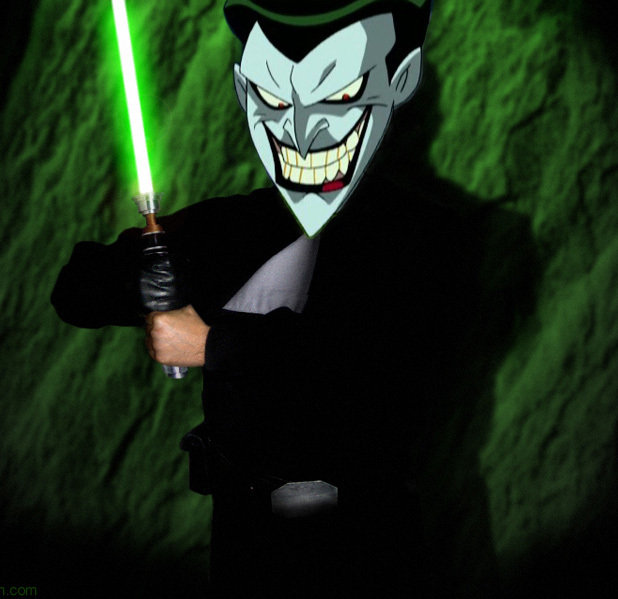 It’s because Mark Hamill has been doing the voice of the Joker on a variety of animated TV shows, movies, and video games for the last two decades. Mark Hamill is today one of the most prolific voice actors in Hollywood. In the last decade alone, he’s done well over 100 different voice acting roles in a variety of TV shows, video games, and movies, including in Ultimate Spider-Man, Scooby-Doo, Robot Chicken, The New Woody Woodpecker Show, Tigger & Pooh and a Musical too, Avatar: The Last Airbender, My Friends Tigger & Pooh, SpongeBob SquarePants, Call of Duty 2, Family Guy, Stuart Little… the list goes on and on and on. Hamill got his start doing voice acting in a film that was released the same year as Star Wars: A New Hope, the cult classic film Wizards. In Wizards he played the role of “Sean, leader of the Knights of Stardust”. The character was even drawn to look somewhat like Hamill. He got his start doing the Joker in the Emmy award winning 1992 Batman: The Animated Series. He’d previously done the voice for the character of Ferris Boyle in the Batman episode “Heart of Ice”, when Tim Curry decided to opt out of doing the voice of Joker; so they gave the role to Mark Hamill. He has since reprised his role as the voice of Joker in the TV shows Superman: The Animated Series, The New Batman Adventures, Static Shock, Justice League, Birds of Prey, and Robot Chicken. He’s also done the voice of Joker in the movies Batman: Mask of the Phantasm and Batman Beyond: Return of the Joker, as well as in video games, such as Batman Vengeance, The Adventures of Batman & Robin, Batman: Arkham Asylum, and Batman: Arkham City. Finally, Hamill lent is voice to various toys and amusement park rides that feature the voice of Joker. As to the inspiration for his now famous version of the voice of Joker, Hamill stated in an interview that he was going for a cross between Hannibal Lecter and Jerry Lewis. You know how there are some stars out there who know how to market themselves? I don’t have that. I’ve learned that the movies [Star Wars] will never finally end. It just goes on and on and on and on. I mean, it’s going to be in 3D, then it’s going to be smellivision, then it’s going to be a ride in an amusement park, then they’ll come to your house and perform it with puppets on your lawn … it’ll never end! I accepted that a long time ago. You know where [the pride] comes from? It’s not so much from the industry… but the 9-year-old kid who looks at you like a cross between Superman and Santa Claus. And you’d have to be a really, really hardened cynic not to be moved by that. Probably my personal favorite thing Mark Hamill has done besides Star Wars was actually a somewhat little known movie-like video game series called Wing Commander. In it, Mark Hamill plays the character of Christopher Blair (in III, IV, and “Prophecy”). Wing Commander IV is particularly phenomenal, also prominently featuring such major actors as John Rhys Davies (best known for his roles as Sallah in the Indiana Jones series, Gimli in Lord of the Rings, and Professor Maximillian Arturo in the TV series Sliders); Malcolm McDowell (Clockwork Orange, Caligula, Star Trek Generations, among many others); John Spencer (best known for his role as White House Chief of Staff Leo McGarry in The West Wing); Josh Lucas (Sweet Home Alabama, Poseidon, etc. ); Francois Chau (Dr. Pierre Chang in Lost); Richard Riehle (Office Space, Star Trek, Ally McBeal, Quantum Leap, The West Wing, etc. ); and last but not least, Thomas Wilson (best known for his role as “Biff” in the Back to the Future series). Besides acting, Mark Hamill also co-wrote a comic book series called The Black Pearl and has also written various Simpsons comics. After Star Wars, Hamill spent timing doing various Broadway shows, including Amadeus, The Elephant Man, The Nerd, and Harrigan ‘n Hart, which he actually sings and dances in and received a Best Actor in a Musical Drama Desk nomination for his portrayal of Tony Hart. He also has lent his vocal talents to various audiobooks, including The Spiderwick Chronicles. Mark Hamill got his first major acting gig on The Bill Cosby Show in “The Poet”, as the character of Henry (1970). He also appeared in The Partridge Family in “Old Scrapmouth”, as the character of Jerry (1971). He later played a more steady role in General Hospital as the character of Kent Murray. He landed a starring role in The Texas Wheelers in 1974 and was cast in a starring role in Eight is Enough in 1977, as the character of David, but he wanted to focus more on his movie career after Star Wars, so tried to get out of the role after the pilot. This was something ABC was initially not willing to let happen. However, the car crash came into play there, causing him to miss filming and so they instead went with Grant Goodeve for Hamill’s role. hmm I didn’t know he was the longest, but I did know he is currently the voice of joker. As a huge fan of all things DC (especially Batman) I knew this, but it was really interesting to hear more about the actor himself. I love his quote at the end, he seems like a great guy! I remember hearing about the car accident and one rumor was that it explained the cuts and bruises on his face in “Empire Strikes Back” when he’s in the rejuvenation tank after Han rescues him out of the snow. Another rumor was that it was the explanation for the way, way, way too much makeup in the “Star Wars Holiday Special”; first there were layers of makeup to cover his cuts and bruises and stitches, and then, on top of all that, the layers that would have been there anyway for lighting and filming and other stuff. He winds up looking like one of his own action figures. You forgot to mention Ginger Lynn (adult film actress) who was in the Wing Commander series with him. His appearance did change so much from A New Hope to Empire. I am shocked to find out that the rumors are not valid. His nose looks completely different so it must have been one helluva break.